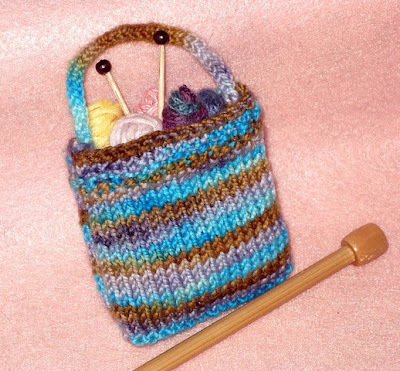 This miniature knitting bag can be completed in an afternoon and makes an excellent ornament or gift for a knitting friend. It's also a great way to use up leftover sock yarn. The bag is knit as one long piece and then folded at the bottom and seamed at the sides. The handle is an I-cord. The finished size is approx. 3.5 inches from the bottom of the bag to the top of the handles and 2.5 inches wide. Using the size 3 needles, cast on 22 stitches. Knit in seed stitch for approx. 2.5 inches. Knit two rows in garter stitch to form the first fold at the bottom of the bag. Purl one row. This is the bottom of the bag. Knit two rows in garter stitch to form the second fold. Sew side seams using mattress stitch. Sew I-cord to inside seam of bag to form handle. Make 4 or 5 tiny skeins using scrap yarn. Dab craft glue on the yarn as you form the skein so it holds its shape. Make toothpick needles by cutting the tips off of two toothpicks and using craft glue to secure each bead to the tip of each toothpick. Stuff the bottom of the bag with cotton or scrap yarn. Dab glue inside so it won’t come out. 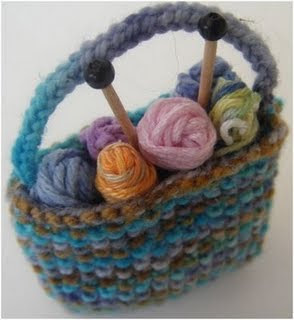 Arrange the tiny skeins near the top of the bag so they are slightly peeking out. Dab glue inside the bag again to secure the skeins. Place the toothpick needles inside the bag so the ends stick out, as shown in the picture. This is soooo cute! I can see it as a tree ornament or a package decoration--would also make a nice brooch for a knitter. This is adorable! Thanks for sharing your idea! Rachel sent me over and Holy Crap that's the cutest little bag ever!!! Thank you for sharing it with us!! I'm generally not a comment-leaver but this is so, so cute and so perfect for an ornament exchange that I'm going to next weekend with my KNITTING friends! But I have to admit, I just learned to knit recently and I do not know how to make the handle! Any further suggestions on this part: "Knit a 5 inch I-cord using size 2 DPNs and two stitches"? Thanks so much for sharing this completely perfect project! Hi Rosie, thanks so much for your note. I added a link to instructions for knitting an I-cord at About.com. It's really easy to do, even for a beginning knitter. Hope you have lots of fun at your ornament exchange. Thanks for sharing this adorable patten. I just finished the seed stitch bag. I was wondering where I could find the patten for the basket weave bag. I love this pattern. Thank you for posting it. In addition to some of the other suggestions mentioned here, this would also be cute as a refredgerator magnet. What a wonderful way to use my bits of leftover sock yarn. Much appreciated. I teach a knitting class at the library, and each year for Christmas I try to come up with an inexpensive ornament to make as gifts for my ladies. This lovely little bag will be the one I make for Christmas 2011. Thank you! Just ran across this pattern and I'm glad I found it. I make a lot of small easy gifts for our retirees group and this will work out great. Love this pattern!!! Where can I also find the basket weave pattern??? Thanks so much!! I'm not real proficient on the computer, but I can't seem to get the whole pattern for the miniature knitting bag pattern to print out. What am I doing wrong? Help! Am also looking for the other bag in the picture. 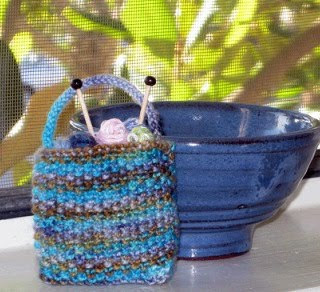 Have made the Minature Knitting bag and would like to make the other one in the picture. Thank You for these patterns. I also would like the pattern for the basket weave. I just finished my first seed stitch bag, but my yarn was a little too heavy, it came out too big. So I just bought some more sock yarn and will try again. Using US size 3 needles, cast on 22stitches. Knit two rows garter stitch. Knit in stockinette stitch for two inches. If anyone tries this modified pattern, please stop back by and let us know of any corrections. Thank you so much for your quick response. Also, how do I favorite your blog. There was no place to click on to favorite it. Also, when I made the I cord, I used three stitches, it makes it a little fuller. I have been making this little bag , but casting on 12 stitches and attaching a key ring to the handle. They also make great zipper pulls. Very cute!! Thanks for the pattern!